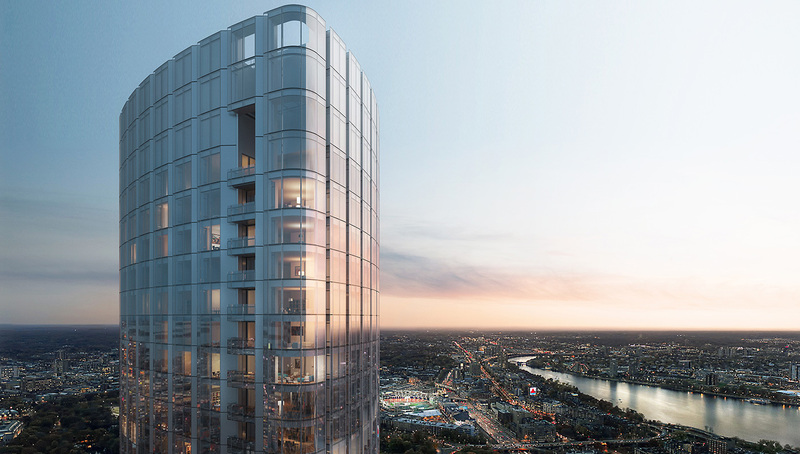 Cambridge-based real estate development firm Carpenter & Co. has put out new renderings of the planned 61-story Four Seasons Hotel & Private Residences at One Dalton St. in Boston’s Back Bay, a project that officially broke ground close to two years ago but has been quiet since. The developers behind the 61-story, 740-foot hotel and luxury condominium tower say it will be Boston’s — and New England’s — tallest residential tower when complete in fall 2018. That title is currently held by Millennium Tower in Downtown Crossing, a 60-story condominium tower that tops out at 685 feet. However, it’s worth noting that Boston’s Millennium Tower has a higher percentage of purely residential tower space — some 442 units compared to One Dalton’s 160 units. The 215-room Four Seasons Hotel will comprise 23 of One Dalton’s 61 stories. Regardless, One Dalton will be the city’s third-tallest tower upon its completion. The project was collaboratively designed by Harry Cobb of Pei Cobb Freed & Partners and Gary Johnson of Cambridge Seven Associates. Thierry Despontof eponymous New York-based firm The Office of Thierry W. Despont Ltd. designed the private residential lobby and the 50th-floor residents’ club lounge, while Boston-based luxury residential firm Campion & Co. is the sales and marketing firm. Suffolk Construction is the general contractor. One Dalton broke ground in a lavish January 2015 ceremony, complete with an ice sculpture replica of the tower and ice sculpture bars serving caviar and champagne. Development teams have since undertaken foundation work. A video on the One Dalton website highlights a “165-foot foundation anchored to bedrock,” a necessity in the landfilled Back Bay neighborhood. HFF announced in February 2015 that it had secured $680 million in financing for the project, including a $500 million construction loan through London-based hedge fund management firm The Children’s Investment Fund Management LP and $180 million in joint-venture equity from Citi Private Bank.